Island of the White Rose Blog: CUBAN AND VENEZUELAN SHELL GAMES--WHEN AND WHERE DID CHÁVEZ DIE? CUBAN AND VENEZUELAN SHELL GAMES--WHEN AND WHERE DID CHÁVEZ DIE? You don’t have to see a skunk to know that there’s one in the neighborhood. My nose is starting to twitch, sniffing the news reports about Hugo Chávez, his medical care in Cuba, his death in its sibling, Venezuela, and the scramble for power now that everyone appears to agree that he is really dead. American newspapers and broadcast media have faithfully reported the announcements of the Venezuelan government, but seldom have they provided enough of a backstory to allow the readers and viewers to understand the context of the reports, so that they can decide whether they are really true. During an interview also given to La Estrella on February 27, 2013, Mr. Cochéz stated that, "Chávez was brain dead since December 31, and was kept alive by artificial means and was disconnected four days prior to the interview at the request of his daughters." Again, Emili J. Blasco of the Spanish newspaper ABC, relied on unnamed military sources to report on March 8, 2013 that on Wednesday, while Chávez's empty coffin was being paraded around Caracas from the military hospital (where the Venezuelan government said Chávez died), to the military academy for seven-hours, they were preparing his body in the Hospitalito morgue, in the Military Academy, after the arrival of his body from Havana. The body was put into a coffin in the basement of this institution. When the false coffin arrived once the parading ended, the coffins were switched, out of sight of the television cameras. Today, the body is still being viewed, seven days after his death. The question arises, was Chávez embalmed in Cuba prior to being flown to Caracas? That might explain the report on February 18, in Mesa Redonda Contracomunista, that Massimo Signoracci, the embalmer of the last two popes was spotted in Havana. http://www.mesaredondacontracomunistabg.blogspot.com/2013/02/que-hace-el-embalsamador-mas-famoso-del.html If true, was he there for Chávez? When did the president really die? Why does it really matter? The deathwatch for Chávez has, at its root, significant constitutional importance for Venezuela and economic implications for Cuba. Venezuela is a lifeline for the Cuban economy that still lies in shambles, despite Raúl’s so-called liberalizations. It is essential to Cuba that the leader who replaces Chávez continue Venezuela’s generosity to Havana. Last October, Chávez was elected President of Venezuela by an 11% margin. Under Article 231 of the Venezuelan Constitution, the president had to be sworn in on January 10th. If the president was unable to be sworn in, either by a temporary or absolute absence, the president of the general assembly, Diosdado Cabello, under Article 231, should have become president and an election should have been called within 30 days. Chávez was not sworn in by the constitutional deadline, and the Chief Justice of the Venezuelan Supreme Court, Luisa Estela Morales, ruled on January 9, 2013, that there was no temporary or absolute absence that required the vice president to take over, and because it was the continuation of the president's mandate, the taking of the oath of office was not necessary. Below is a photograph of the Chief Justice. 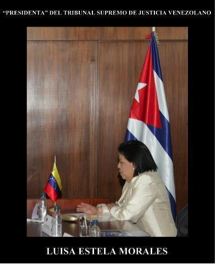 Note the large Cuban flag in the background and the small Venezuelan flag on her desk. On December 9, 2012, before leaving Venezuela for his last cancer surgery in Cuba, Chávez announced that should he not be able to continue on as president that Vice President Maduro would be his designated successor. He asked the Venezuelan people to vote for Maduro. 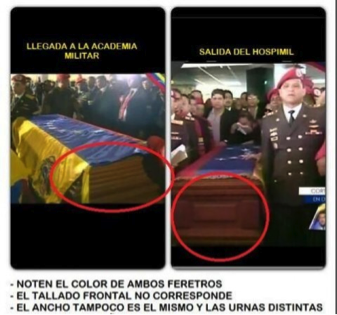 Not surprisingly, Maduro was sworn on the day of the funeral in front of Chávez's coffin. On Sunday he announced that he would be a candidate for president in an election to be held on April 14th. Article 229. A person holding the office of Executive Vice-President, Minister or Governor, or Mayor, as of the date he announces his candidacy or at any time between such date and that of the Presidential election shall not be eligible for election to the office of President of the Republic. Again, Chief Justice Luisa Estela Morales indicated that upon the death of the President of the Republic, the Executive Vice President assumes the Presidency and leaves his previous position. In his capacity as Interim President, he has all the constitutional and legal powers as the Head of State, Head of the government and Commander in Chief of the Bolivarian National Armed Force. Herein lies the second shell game. After January 10, was there a void of power in Venezuela since both Chávez's and Maduro's term had come to an end? If so, neither Chávez nor Maduro were in power on the alleged date of death. If by some twisted logic Maduro was still Vice President when Chávez died, shouldn’t he have to resign to run for president? By keeping Chávez out of sight of the cameras through his final illness, there is no verifiable means to determine when and where he died. Is Maduro a usurper? More importantly, is this a bloodless coup-d'état by a putative President? If ever there were an Oliver Stone series of events it has been the past three months of Chávez’s mercurial existence, floating back and forth between Caracas and Havana. It is no secret that Maduro is the fair-haired boy that the Castros have wanted to succeed Chávez. "This sly and courtly man with an obsessive ambition of command, discovered early on that Diosdado Cabello, his competitor in Chávez's succession, had the advantage of more support in the party, in the armed forces, in the Bolivarian bourgeoisie, and that he had managed to amass a fortune that gave him greater autonomy of action than Maduro had. Both Maduro and Cabello are too shrewd to be believing in communism and other obsolete doctrines, but played Chávez's game because they have no other way to survive in politics for now. Chávez was the absolute master and they have to feign ideological loyalty to him and his nonsense. The foregoing discussion is admittedly a tattered weaving of stories that have appeared over the past few weeks on the Internet. The fact that the whereabouts and the condition of Chávez was treated as a state secret, in both Havana and Caracas, lends credibility to the commentators whose views are discussed above. I’m not certain where the truth lies. The whole tawdry mess makes me grateful to live in a country where the freedom of the press makes it unlikely that such intrigue could successfully be repeated here. I think that the photograph of the Chief Justice of the Venezuelan Supreme Court sitting to the side of a large Cuban flag and with a tiny Venezuelan flag on her desk, explains a lot. The web of deceit that has been spun to keep the Venezuelan people in the dark about the alliance that continues between the Cuban and Venezuelan governments is amazing. You describe the events surrounding Chavez's death so precisely, it gives the reader a clear view from behind the veil. Great job!